Once upon a time there was a witch called Ursula Kempe, who suffered a terrible injustice put upon her in the 1582 Witch Trials of Essex. Ursula lived her life in St Osyth Village, Essex, with her eight year old son Thomas, until being accused of witchcraft by the local magistrate Brian D’arcy. Along with 13 other woman, she was imprisoned in the local Lockup, the Cage, before being transferred to Colchester Gaol and her subsequent trial. Found guilty and hanged with one other lady in Chelmsford, you would think the story of this wronged woman would end there. But in 1921 in Mill Street, St Osyth, a skeleton was unearthed in the back garden of a Mr Charlie Brooker. Buried in a north/south direction, the tale of Ursula Kempe was about to be born again! It was promptly claimed by many to be the skeleton of the infamous St Osyth resident, and so many paid a few pennies to her in her pitiful resting place of 37 Mill Street! This went on for over 10 years until the house of Mr Brooker mysteriously burned down and the skeleton was covered up again. Maybe a discarded cigarette left unattended burned down his house? A faulty house appliance? Some deeper thinking people would say its poetic karma for disturbing the dead in more ways than one! In 1963, the skeleton was uncovered yet again because Mr Brooker’s son-in-law wanted to apparently build on the location. And so comes along a Mr Cecil Williamson, who owning the Boscastle Museum at the time, expressed an interest to buy the skeleton and display her in the museum, still believing, like many, that this was Ursula Kempe. After a lengthy delay ‘she’ was eventually transported to Boscastle in Cornwall, where she stayed until ill health forced Mr Williamson to sell her on and she was bought by the famous artist Robert Lenkiewicz and transported to Plymouth in 1999. Mr Lenkiewicz died in 2002 and this is where the story of the skeleton gets told correctly, because, upon request, the skeleton was eventually transported to a Mr John Worland, back in Essex. It was decided that the skeleton was to be extensively examined by an archaeologist and through her findings, it was revealed the skeleton was not in fact Ursula Kempe, but a man! 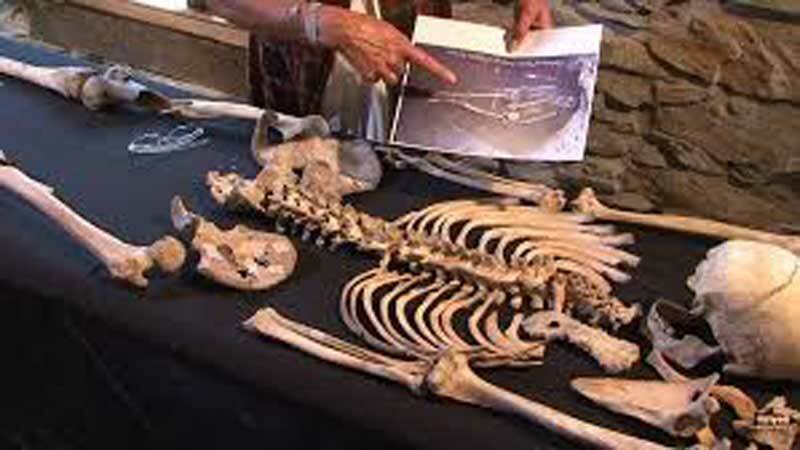 Skeleton of St Osyth was a man, not a woman! A man of heavy build, height was estimated at 5ft 8in, a hardworking individual whose age was put into the early 20s. During the time of these findings, it was also revealed and mentioned in newspaper reports that iron spikes found in the skeleton’s bones were deliberately put there after it was unearthed. This was intended to enlarge the story that it was the skeleton of Ursula Kempe adding to the hype of the day. The archaeologist examines the bones of the skeleton found at St Osyth. It was also revealed by the archaeologist that staining found on the upper part of the skeleton indicated that he wore a bronze medallion when he was buried in Mill Street. This had disappeared after he was unearthed. Through all the upheaval and drama of being branded one of the most famous witches in Essex, the male skeleton was finally laid to rest with dignity, in a local St Osyth Cemetery, albeit in a north/south direction as he was originally buried. It amuses me to this day, even with evidence to the contrary, that there are still people that consider this skeleton to be Ursula Kempe. It brings up that saying, research and research some more. Sometimes the truth is hidden waiting to be unearthed. MO KEOHAN is Hertfordshire native with a healthy interest in the paranormal. She enjoys researching haunted places, including Cold Christmas, Minsden Chapel, High Beach Church and her family home in Ireland which has a ghostly past. Besides her paranormal work, Mo enjoys studying and running an online business. Visit her D.A.S.K. 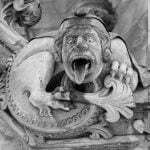 Paranormal Facebook group here. Mr Charlie Brooker, grave robber also?., along with being a callous trickster greedy enough to damage human remains to increase profit. Enter the son-in-law, displaying the same characteristics forced to overcome the problem the old man had created; Making known the location of a burial also made it an inconvenient legal one, in the way of family profiteering, building. Too ‘religious’ to drag the skeleton from its resting place, he employed his son for the task, another lacking in respect, found the ‘digging easy’, giving no remarks on lifting the remains, we could assume he too shared the same disregard for the dead as his elders, and should face legal retribution for breaking the law …and so willingly. House burning; Brooker’s grandson/grave digger, tells us his Granddad over indulgence of Guinness probably caused the fire, the Grandson saying that suggests he is repeating fact passed down to him rather than guesswork since it is such a damaging statement to make about an ancestor he seems to view as a lovable rogue. The other possibility is an insurance job?, not unheard of in those days of Charlie Brooker’s, and by the sound of it, not beyond him. Whichever the right conclusion, they are based on hints of dubious familial traits. All the above can be forgiven, balanced by Charlie buying ALL the poor families, in the village, a Christmas Goose, allegedly, hard to see how a cold hearted profiteer would do something so expensive?, but maybe he did, as an investment against him doing festive bird?. Paranormal is not involved with any of the above, subnormal is. Guest writer MJ WAYLAND takes a look at historic Dudley Castle - the Black Country's most haunted! Strange story of a 'ghost' being captured in Chelmsford, Essex, back in 1883! What evil lurks inside the haunted St Osyth Witches Cage in Essex?